By Nita Kerepeti-Ikin, a recently Certified TetraMap Facilitator from the Wellington Certification course, February 2018. Before you read the poem here is some background about Nita and what inspired her to write this incredibly creative poem about the Elements. Nita’s inspiration came from some remarkable women! Waireti supported me in an interview for my very first job in health, in the area of Maternal & Child Health at Whangarei Base Hospital. She was a tireless advocate for Maori health across the greater Tamaki Makaurau area, before retiring to Kaitaia where she became even busier, involving herself in her home community and Marae life. She was also an exceptional friend. I manage Te Paepae Arahi; a kaupapa Maori health organisation based in Te Awakairangi (Lower Hutt). I’m really just an administrator in place to support the team and the Board of Trustees. The team is where the rubber meets the road, so to speak, and where real engagement with community occurs, i.e. that being our organisation’s clients. So how can TetraMap help me in my work? Well, I think the question is, “How can TetraMap help me in life?” The only thing I can say to this is it already has and it continues to do so. 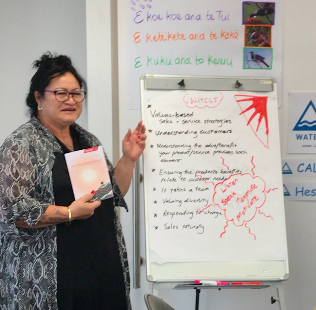 I’m incredibly excited about exercising my new knowledge of TetraMap with others; not just at work but amongst whanau (family) and hapu (community) too. I’m practicing being calmer like a lake, and while order appeals to me, I’m that staff member who reads the policy and/or worries about the procedure afterwards, never before. I tend to go with what feels, looks, and sounds okay. I ask myself things like, “is it just, is it fair, is it reasonable, will it cause any harm to myself or others”? Humpty Dumpty was an egg, an egg who sat on a wall. A silly egg one might say because eggs don’t sit very well at all. No wonder Humpty had that great fall, from where he sat on that great wall. The wall was tall I dare say, or Humpty might be alive today, to tell the tale of how far he fell, when he crashed to the ground and broke his shell. Now I wonder, did Humpty consider a plan may be, you know, a map, a process, to guide his quest you see. Could his effort have been made more complete, more robust, if in systems, policies, other people, he’d shown more trust? That old Humpty he was selfish, as selfish as can be, the egg clearly failed to consider his poor egg family; below the line behaviour, wouldn’t you agree. He just clambered on up that wall, that tall tall wall, gave not a care, not a care, not a single care at all. He should have been patient, talked to others, tell his mother, stayed calm. Alas, not old Humpty, he just took off, climbed that wall, had the fall, caused alarm. Then in came all the king’s men and all his horses too, and despite their strength and numbers, they didn’t have a clue what to do. They measured the height of the wall, studied the depth of the fall, they glanced where Humpty fell and mourned his broken shell. And whilst the King’s horses and those right royal men, couldn’t put Humpty together again… they looked towards nature and remembered, together we are greater than the sum of our parts, we have those with ideas, and those with heart, some to make a plan, so we can take some action, so we can make a start… together we’ll fix old Humpty, bit by bit, part by part. We’ll work together with the King’s many and a few more people too, we’ve got your back Humpty, when we’re finished you’ll be good as new. This is brilliant. Can we share it if we give credit Nita Kerepeti-Ikin – I know some other people who would love it? Yes please do share, that’s what it’s all about, sharing our Facilitators great work! We love this blog too! Waireti Walters was awarded the Queens Service Order in 1998, a pioneering Māori community health worker and a powerful advocate for breast and cervical screening for Māori women, who died in 2015, aged 81. 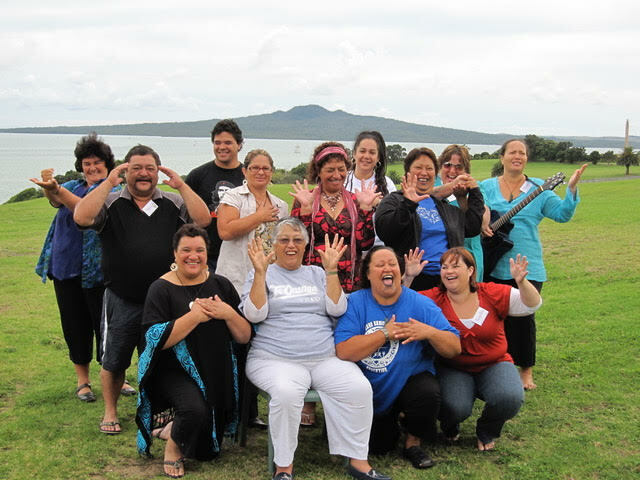 This was taken at Orākei Marae in 2009 with Kataraina Pipi, Master TetraMap Facilitator. 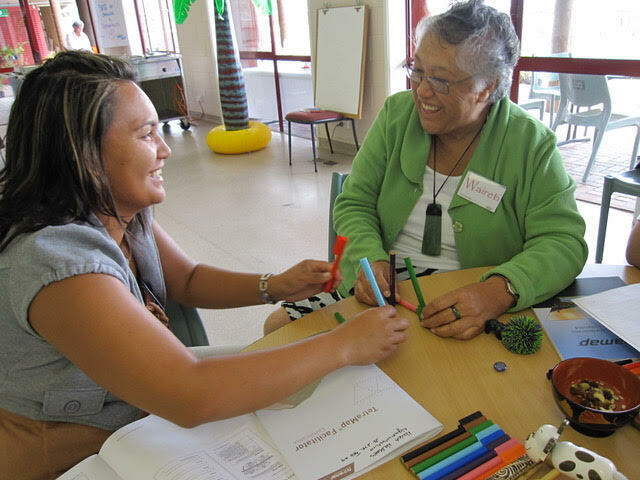 Waireti Walters, Certified TetraMap Facilitator, with her TetraMap workshop participant in 2009. Building Tetrahedrons together.